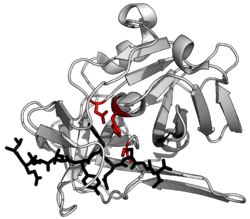 A protease (also called a peptidase or proteinase) is any enzyme that performs proteolysis; protein catabolism by hydrolysis of peptide bonds. 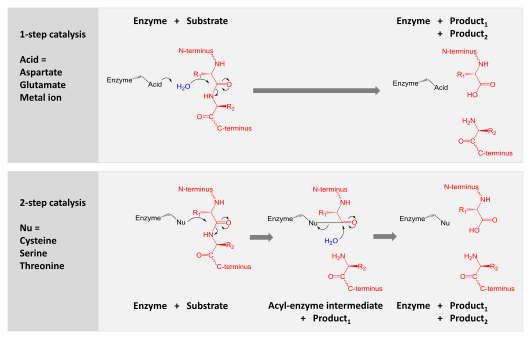 Proteases have evolved multiple times, and different classes of protease can perform the same reaction by completely different catalytic mechanisms. Proteases can be found in Animalia, Plantae, Fungi, Bacteria, Archaea and viruses. Serine, threonine and cysteine proteases use a nucleophilic residue in a (usually in a catalytic triad). That residue performs a nucleophilic attack to covalently link the protease to the substrate protein, releasing the first half of the product. This covalent acyl-enzyme intermediate is then hydrolysed by activated water to complete catalysis by releasing the second half of the product and regenerating the free enzyme. Proteases occur in all organisms, from prokaryotes to eukaryotes to viruses. These enzymes are involved in a multitude of physiological reactions from simple digestion of food proteins to highly regulated cascades (e.g., the blood-clotting cascade, the complement system, apoptosis pathways, and the invertebrate prophenoloxidase-activating cascade). Proteases can either break specific peptide bonds (limited proteolysis), depending on the amino acid sequence of a protein, or break down a complete peptide to amino acids (unlimited proteolysis). The activity can be a destructive change (abolishing a protein's function or digesting it to its principal components), it can be an activation of a function, or it can be a signal in a signalling pathway. Bacteria secrete proteases to hydrolyse (digest) the peptide bonds in proteins and therefore break the proteins down into their constituent monomers (amino acids). Bacterial and fungal proteases are particularly important to the global carbon and nitrogen cycles in the recycling of proteins, and such activity tends to be regulated by nutritional signals in these organisms. The net impact of nutritional regulation of protease activity among the thousands of species present in soil can be observed at the overall microbial community level as proteins are broken down in response to carbon, nitrogen, or sulfur limitation. Some viruses express their entire genome as one massive polyprotein and use a protease to cleave this into functional units (e.g. polio, norovirus, and TEV proteases). These proteases (e.g. TEV protease) have high specificity and only cleave very restricted set of substrate sequences. The activity of proteases is inhibited by protease inhibitors. One example of protease inhibitors is the serpin superfamily, which includes alpha 1-antitrypsin, C1-inhibitor, antithrombin, alpha 1-antichymotrypsin, plasminogen activator inhibitor-1, and neuroserpin. ↑ Kohei Oda (2012). "New families of carboxyl peptidases: serine-carboxyl peptidases and glutamic peptidases". Journal of Biochemistry. 151 (1): 13–25. doi:10.1093/jb/mvr129. PMID 22016395. ↑ Mitchell, Richard Sheppard; Kumar, Vinay; Abbas, Abul K.; Fausto, Nelson (2007). Robbins Basic Pathology. Philadelphia: Saunders. p. 122. ISBN 1-4160-2973-7. 8th edition. ↑ van der Hoorn, RA (2008). "Plant proteases: from phenotypes to molecular mechanisms.". Annual Review of Plant Biology. 59: 191–223. doi:10.1146/annurev.arplant.59.032607.092835. PMID 18257708. ↑ Zelisko, A; Jackowski, G (October 2004). "Senescence-dependent degradation of Lhcb3 is mediated by a thylakoid membrane-bound protease.". Journal of plant physiology. 161 (10): 1157–70. doi:10.1016/j.jplph.2004.01.006. PMID 15535125. ↑ Sims, G. K.; Wander, M. M. (2002). "Proteolytic activity under nitrogen or sulfur limitation". Appl. Soil Ecol. 568: 1–5. ↑ Woessner, edited by Alan J. Barrett, Neil D. Rawlings, J. Fred (2004). Handbook of proteolytic enzymes (2nd ed.). London, UK: Elsevier Academic Press. ISBN 0-12-079610-4. ↑ Hooper, ed. by N. M. (2002). Proteases in biology and medicine. London: Portland Press. ISBN 1-85578-147-6. ↑ Feijoo-Siota, Lucía; Villa, Tomás G. (28 September 2010). "Native and Biotechnologically Engineered Plant Proteases with Industrial Applications". Food and Bioprocess Technology. 4 (6): 1066–1088. doi:10.1007/s11947-010-0431-4. ↑ Southan, C (Jul 1, 2001). "A genomic perspective on human proteases as drug targets.". Drug Discovery Today. 6 (13): 681–688. doi:10.1016/s1359-6446(01)01793-7. PMID 11427378. ↑ Puente, XS; López-Otín, C (April 2004). "A genomic analysis of rat proteases and protease inhibitors.". Genome Research. 14 (4): 609–22. doi:10.1101/gr.1946304. PMC 383305 . PMID 15060002.